... or Barking Mad Dog Training Schools! 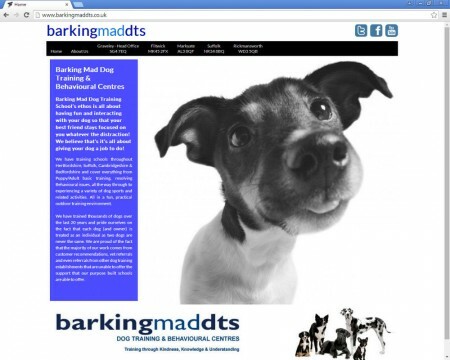 barkingmaddts are a friendly and highly experienced team, 100% committed to making training fun and effective for you AND your dog. There is so much to talk about with this one; not least of which is the fact that it's full of fantastic dog photos! The core of the system is built on our standard Content Management System but has an extra module that provides the administrators with a fully functional, perpetual diary. Training Courses and other Special Events can be booked along with their Type, Location, Times and Instructors assigned. Each "Region" has it's own Team Profiles, Courses, Diary, Gallery and Testimonials all of which relate only to that location and is administered by the Regional Manager. Regional Managers only have access to their own region for content updates and diary entries, making it almost like giving each region it's very own web site.